C1424. CHARLES MUNCH Cond. Boston S.O. 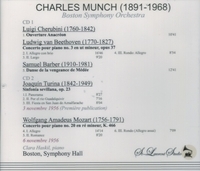 : Anacreon - Overture (Cherubini); Medea's Dance of Vengeance (Barber); Sinfonia sevillana (Turina); w. Clara Haskil: Piano Concerto #3 in c (Beethoven); Piano Concerto #20 in d, K.466 (Mozart). (Canada) 2-St Laurent Studio YSL T-313, Live Performances, 3 & 6 Nov., 1956, Symphony Hall, Boston. Transfers by Yves St Laurent. "Haskil's return visit [to Boston] surpassed all expectations. 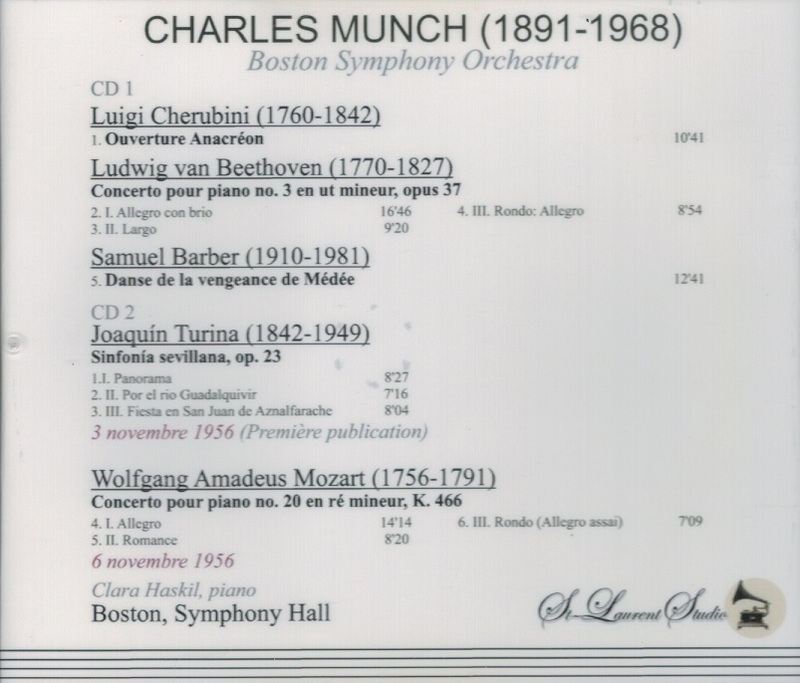 A series of concerts with the Boston Symphony Orchestra under Charles Munch and an appearance at Carnegie Hall created a sensation and were reported in TIME MAGAZINE. Rudolf Eli wrote in the BOSTON HERALD, 'One of those most magical revelations that occurs in music once in a generation ... the most beautiful performance of Beethoven's Third Concerto I have ever heard or expect to hear again'. I first heard Clara Haskil's name mentioned by Dinu Lipatti after a recital he gave in Switzerland. When I congratulated him on his Mozart playing, Lipatti said, 'In two weeks' time you must hear Clara play Mozart. Then you will realize how far the rest of us are from the truth'. I was young at the time, but the name stuck in my mind. Who was this mysterious Clara? As Clara sat down the music materialized as if from nowhere. Her arm seemed to glide over the keyboard without preparation, just as a flat stone skims across the water. This was so typical of her playing; nothing seemed to start or end, and everything became timeless. Admiration and international fame came late in life for Clara Haskil, in a career beset by poor health and the adversities of a world war. 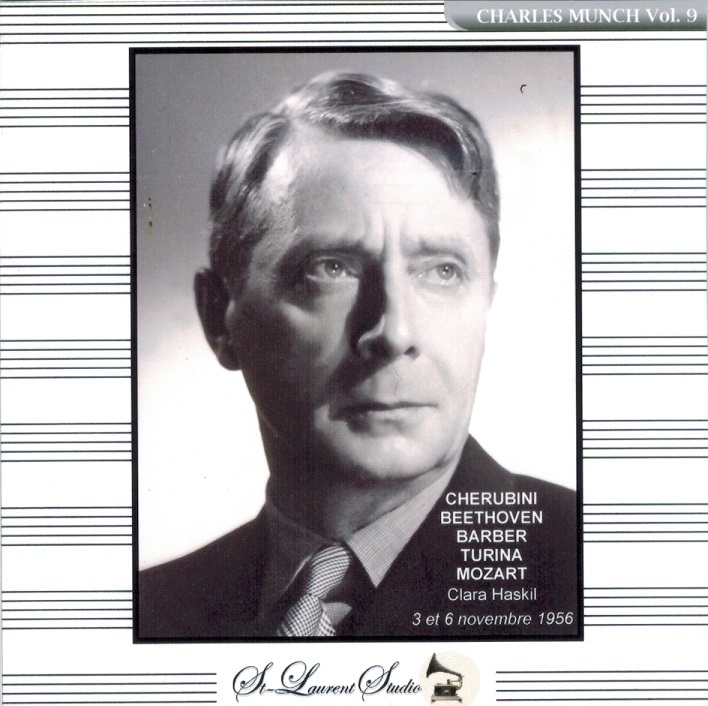 Dinu Lipatti described her playing as 'the sum of perfection on earth', Wilhelm Backhaus called it 'the most beautiful in the world', Tatyana Nikoleyeva burst into tears when she first heard Haskil...."
"Turina was a gentle man who, like Segovia, placed high value on beauty and clarity of thought, and responded to 'programmatic' images; the portrayal of profound tragedy had no place in his music. Although he tried harder than his contemporaries to write in the conventional musical forms, his Sinfonia sevillana is a poetic and colourful tone poem rather than a symphony, a French-influenced depiction of aspects of the city of his birth."